H.E. Mr. Enock Nkuruho becomes Uganda's second High Commissioner to represent Uganda in New Zealand. While presenting his credentials on the 12th of March 2014, the High Commissioner extended warm greetings from H.E. President Yoweri Kaguta Museveni to His Excellency the Governor-General and said that Uganda looked forward to greater cooperation with New Zealand. He hailed New Zealand for being among the fastest growing economy in the developed world. He also noted the importance of livestock in New Zealand's export earning and its total economy and hoped that Uganda could learn from New Zealand. He then called for improved bilateral cooperation between Uganda and New Zealand. His Excellency, Sir Jerry Mateparae thanked the High Commissioner for his kind words and asked H.E. Mr. Nkuruho to please convey his good wishes and thanks to H.E. President Museveni. His Excellency Sir Jerry said that New Zealand has a high regard for Uganda's leadership, within its region and internationally. New Zealand was pleased to support Uganda's election to the United Nations Security Council as s Non-Permanent Member for 2009 and 2010. He welcomed Uganda's initiatives on post-conflict and peace building during its time on the Security Council. He stated that the election of Honourable Sam Kutesa, Foreign Minister of the Republic of Uganda, as President of the 69th United Nations general Assembly is an acknowledgment of the esteemed on-going international leadership Uganda offers. H.E. Sir Jerry Mateparae was sworn in as New Zealand's 20th Governor-General for a five year term on 31st August 2011. He was born in 1954 and raised in Whanganui. Of Maori descent, his tribal affiliations are to Ngati Tuwharetoa and Ngati Kahungunu. He is New Zealand's second Governor-General of Maori descent. The Governor-General of New Zealand is appointed on the recommendation of the Prime Minister of New Zealand to serve as the representative of the Head of State, the Queen of New Zealand. 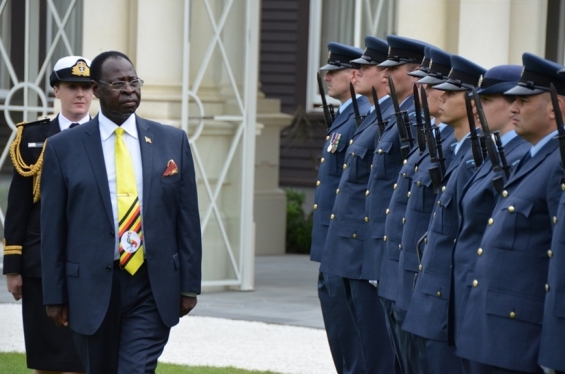 The Governor-General is a symbol of unity and leadership, with the holder of the Office fulfilling important constitutional, ceremonial, international, and community leadership roles.